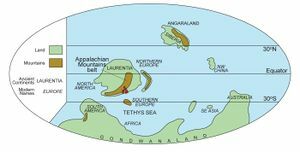 At the end of the Devonian, Ireland lay on the southern margin of Laurentia that stretched from the Appalachians, northeast across Britain into Fennoscandia  (P947814). Coastal alluvial plains merged into shallow tropical waters at the edge of an inhospitable desert landscape. Although marine conditions had reached the southern tip of Ireland at the Devonian-Carboniferous boundary (c.355Ma) the succeeding 10Ma passed before the transgression reached the north of Ireland in the late Tournaisian . This is only the first event in the turbulent 65Ma history of the Carboniferous in Northern Ireland (c.355–290Ma). Throughout the succession there is evidence of intermittent tectonic activity. 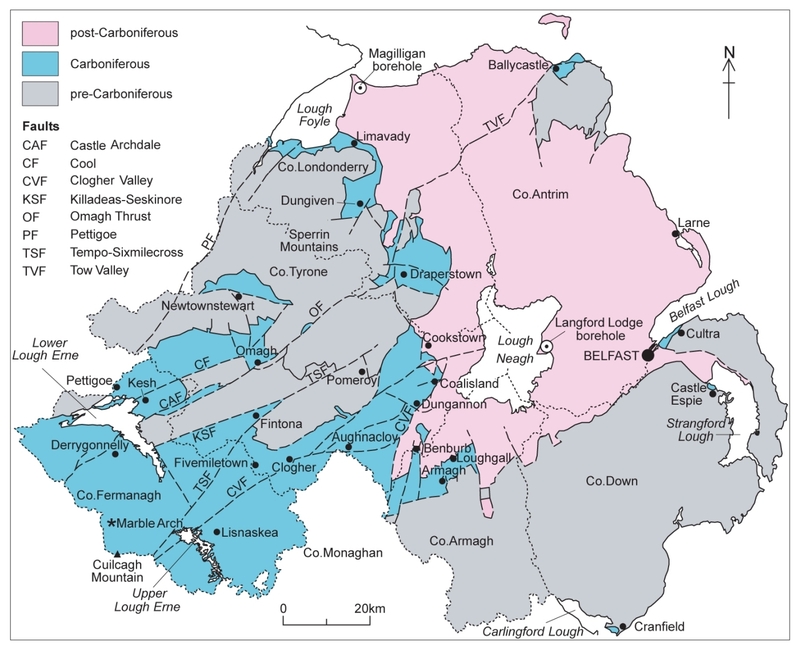 Northern Ireland was not an area of quiet sedimentation, as previously envisaged, but straddled a zone of dextral strike-slip comparable to the Midland Valley of Scotland and the Maritimes Basin in Atlantic Canada . 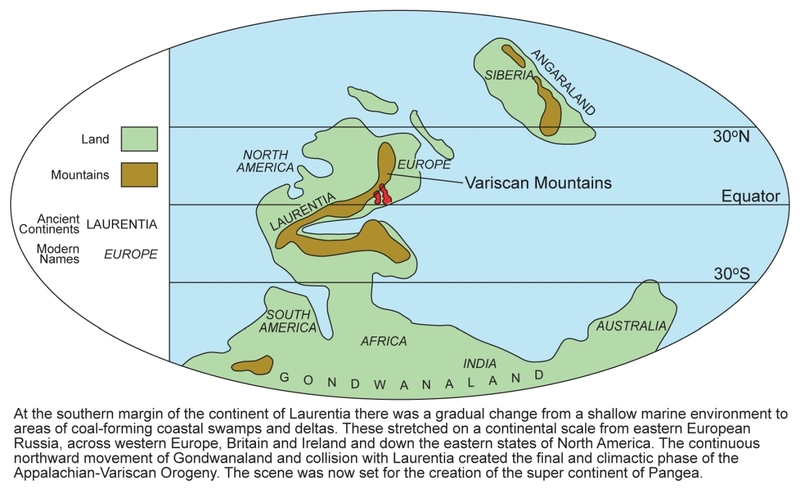 Thus, by the end of the Carboniferous, when the Variscan Orogeny had reached a maximum intensity, all of Ireland was now land and the Variscan Mountains stretched across the northern part of the country (P947838). 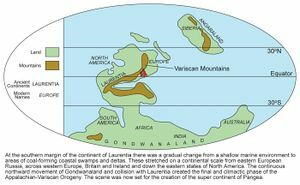 Carboniferous rocks in Northern Ireland were deposited close to the northern margin of the "Northern Province"  and reflect the proximity of land at all times. Their cumulative thickness of 7000 m is represented mainly by Lower Carboniferous (Tournaisian, Viséan and early Namurian) rocks in Co. Fermanagh, the Fintona Block, peripheral sections at Coalisland and isolated basins such as Newtownstewart (P947927). The most continuous outcrop and succession extends from Co. Fermanagh and south Co. Tyrone into north Co. Armagh (P947815). 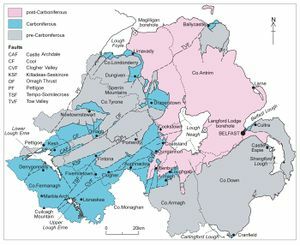 The Carboniferous outcrop in the eastern part of Northern Ireland is reduced to outliers at Ballycastle, Cultra, Castle Espie and Carlingford Lough. ↑ Clayton, G, and Higgs, K. 1979. The Tournaisian marine transgression in Ireland. 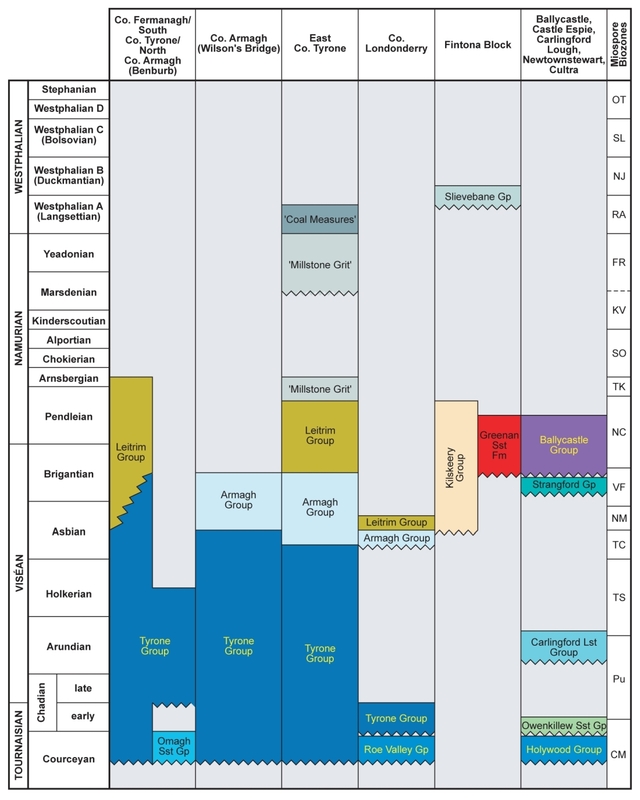 Journal of Earth Sciences of the Royal Dublin Society 2, 1–10. ↑ Calder, J H. 1998. The Carboniferous evolution of Nova Scotia. In: Blundell, D J, and Scott, A C. (eds.). Lyell: the Past is the Key to the Present. Publication of the Geological Society, London, No. 143, 261–302. ↑ Sevastopulo, G D, and Wyse Jackson, P N. 2001. 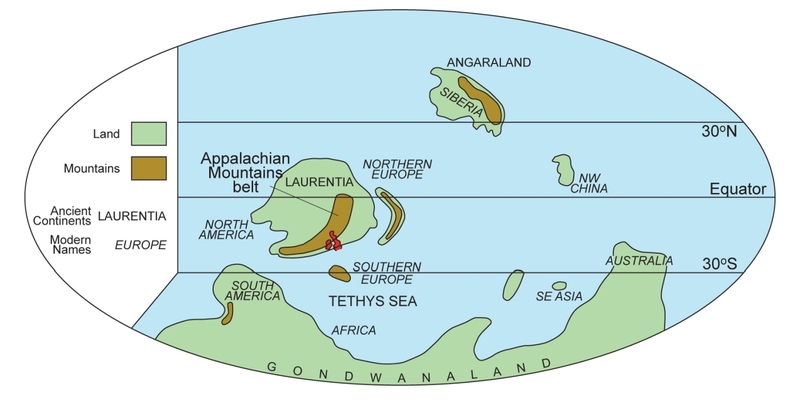 Carboniferous (Dinantian). In: Holland, C. H. (ed.). The Geology of Ireland. Dunedin Academic Press, Edinburgh. This page was last modified on 25 September 2017, at 12:12.